The possibilities of fall gardening and decorating are now under way; the colors of autumn so iconic to the outside of homes as the weather cools down after summer beckon easily for the eyes at Wolff’s Apple House. Bloom-boasting hardy mums, asters, Montauk daisies, brightly cheerful pansies, cabbage, kale, hay bales, decorative corn stalks, gourds and eye-stirring arrays of Indian corn are now in stock. Traditional orange as well as curiously hued and shaped heirloom pumpkins are all making homes for themselves at Wolff’s, too, until you scoop them up so they can start another autumn life at your own home. A few varieties range from cute tight little pom-pom shapes the size of a ping-pong ball to bigger, broader blossoms that look reminiscent of daisies and zinnias, she explains. 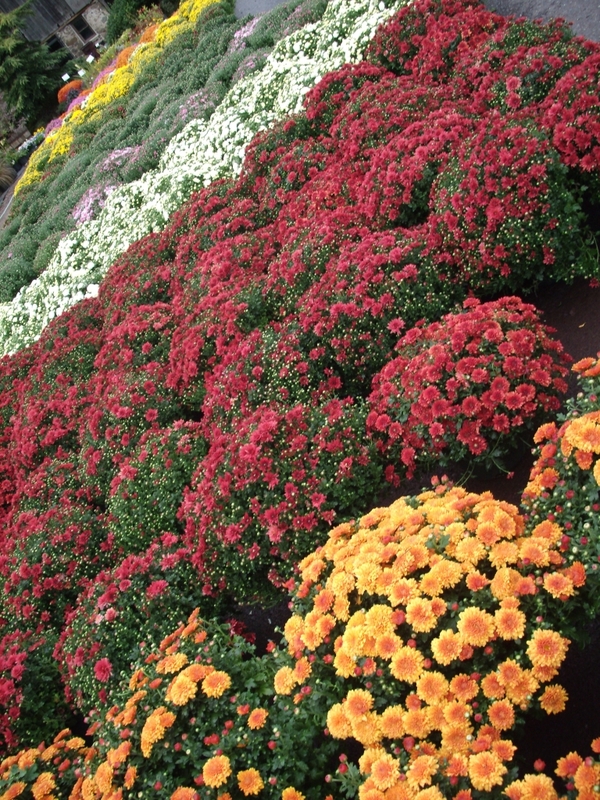 Most mums grow in a nine-inch pot; some are raised in hanging baskets, but the mammoth of them all is a jumbo mum that spans a ball of blooms around three feet across. Hardy asters range in angelic hues of white to light pink, dark pink, purple and lavender. And then the greenish white to greenish purple persuasion of cabbage and feathery, wispy kale summon autumn and winter color strengths for outside of homes as the weather gets chillier. Johnson also notes that cabbage and kale accent window boxes and planters swimmingly, as they brighten up the front of a house, porch or back patio as autumn and winter make their introductions. The four-and-a-half-inch pots of cabbage and kale suit well for this decorative approach. And it’s nice to know that all of these plants are grown locally in Southeastern Pennsylvania and in our neighboring Garden State of New Jersey. Comforts through colors and scents are a lot of what strike those who visit Wolff’s each autumn as they make their way through the door. “The store is abounding with a beautiful palette of fall colors, and customers always comment on how beautiful the store is in the fall,” Wolff says. Fall is known well for its delightfully delicious smells, too, remember.